I developed this recipe last month in preparation for Thanksgiving. Yes, you heard me right: Thanksgiving. I know that Turkey Day is months away, but now is the perfect time to try out new holiday recipes without the pressure of extended family and a big turkey in your kitchen. Plus many of our fall favorite ingredients like kale, potatoes, mushrooms and carrots are also in season during Central Texas’ late spring months, making them cost effective and easy to find this time of year. This recipe is my mostly-local, from-scratch answer to traditional green bean casserole. This kale dish has the creamy-salty-crunchy qualities that make green bean casserole great, minus the gelatinous condensed soup, palm-oil soaked onions, and soggy canned beans that make it not so great. I’m using curly kale here since it’s cheap and in season in Austin in the fall. However, I’ve made this dish successfully with baby spinach, fresh green beans, field peas and chard, too, by reducing the cooking time for the tender veggies and increasing it for the field peas. Experiment now with your family’s favorite ingredients so that you’ll have your own version perfected in time for Thanksgiving dinner! Preheat the oven to 350 degrees. In a large pan, saute the onion and garlic in olive oil and 1 tablespoon of butter over medium heat. Once onions are tender, add the chopped kale to the skillet along with the wine. Cover and cook for 7 minutes, until kale is bright green and tender. Meanwhile, use an electric mixer to cream together the remaining melted butter, softened cream cheese, milk, salt and pepper. 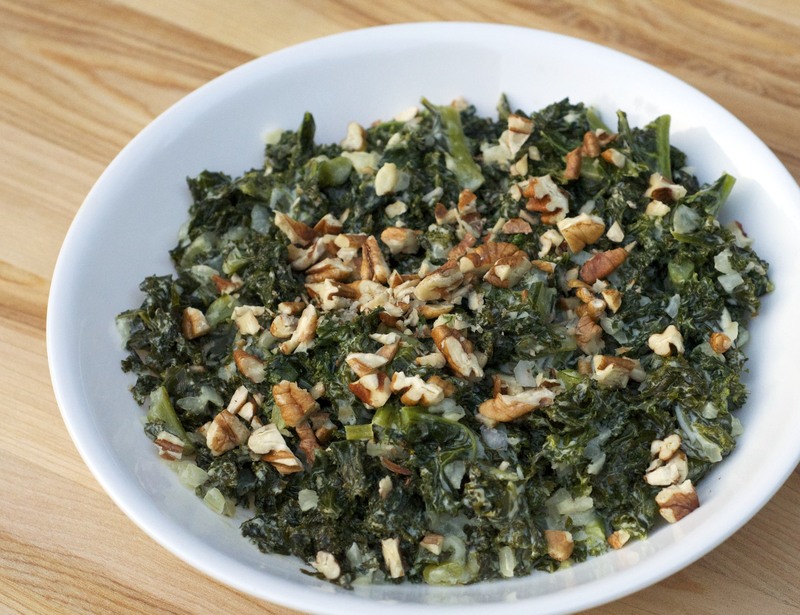 Once kale is par-cooked, combine it with the cream cheese mixture in a 1.5 quart casserole dish. * Top with chopped pecans and bake in preheated oven for 35 minutes. *To make this dish ahead of time, follow the recipe up to this point. Store the casserole dish, covered with plastic wrap, in the fridge for up to two days. Bring the creamed kale to room temperature and remove the plastic wrap before adding pecans and baking the dish as directed. This entry was posted in Dietary Restrictions, Gluten Free, Recipes, Sides & Appetizers, Vegetables, Vegetarian and tagged Food, Garlic, Gluten Free, Kale, Onion, vegetarian. Bookmark the permalink. What a great idea! I never thought of cooking recipes this far ahead of time to test them out. It would definitely allow for the opportunity of tweaking things and trying it again if necessary too. The chaos in the kitchen the day of Thanksgiving is certainly not conducive to trying new recipes; and every year we talk about adding a new dish, but inevitably fallback on the usual suspects. This may be the way to break that cycle!